If people like this recipe i use, then ill go ahead and make more instructables on other kinds. I have a lot of friends ask me how i make my ramen, and for the longest time i always tried to explain it to them. Now I'm pretty terrible at explaining things so i figured its about time that i go ahead and make a tutorial on it. **PLEASE NOTE** If you are not fast at food prep i think you should prep your toppings before you do anything else, so your ramen isnt left sitting while you are slowly cutting everything up. (all except the egg). Just take a look at step 6. I always prep my toppings while everything is cooking, as i find it easier. Step 2: Prep Your Shitake! I buy dehydrated Shitake, for two reasons. One, it lasts a really long time if stored correctly. Two, the water you use to rehydrate them, makes excellent stock. Prepping shitake is very easy. Just boil a kettle, put 4 shitake mushrooms in a measuring cup and fill it up with boiling water to 500ml. Let those mushrooms stand for about 30 mins. Watch some TV or prep your toppings. Step 3: First Things First! I stab a hole in mine, just a very very small one in one end. It makes it easier to peel when its done. So your not juggling a hot egg or peeling off tiny pieces and going crazy. Its normal for a small amount of egg to ooze out while its cooking. I let my water get super hot first, once boiling thats when i put my egg in, now i like mine pretty soft so i only leave it for about 5 - 6 mins, if you want it harder leave it longer! While your egg is cooking, or you are waiting for your water to boil, you should make a start on the ingredients you need for your soup. Also start on your toppings. Step 4: Making the Soup Base. Start cutting up about half a clove of garlic (you can use more, but i have bad gut flora which tends to get upset when i have too much garlic.) I probably wouldnt use more than a clove though. I also cut off a small piece of ginger, i quite like ginger so i tend to use more than most, its really just a taste thing for the ginger, so add however much you like. Get one green onion and cut it in half, and put the other half aside. Leave the greener end aside for topping later on and dice up the lighter end. Dice up 2 of the 4 shitake that you put in the water to hydrate, and hopefully you should end up with something looking like picture 2. In a hot pot, put about a teaspoon, of sesame oil. Leave it to heat so you can see small amounts of steam/smoke coming off it. Then add in your garlic, ginger, onion, and shitake and let it start cooking. While that is cooking add in your chopped chives, and rice seasoning. Cook until lightly brown, and very aromatic. About 2 minutes. Add in your Shitake water (all 500ml of it) and 2 chicken stock cubes. The stock cubes i have require 1 cube to every 250ml. Just check the instructions on your own. Once that boils add in your noodles (any of the kinds i mentioned in the 1st step) I used my own that i hand made which is why they look a little different, as i keep them frozen. Cook this for about 2 minutes and keep prepping your toppings. This is the toppings you can organise while waiting on the soup to cook, or you can do them (except the egg) before you start. Step 7: Time to Dress It! This is my ramen finished. Looking kinda boring huh? This is the part where i dress my ramen up. Hopefully you will have gotten your toppings ready as you went along waiting for this to cook. Use a fork to place your toppings so you dont burn yourself, gently pressing it in to the soup. I put my baby corn in first, and press it right down into the soup, and then put more on top. Then i add my egg and chilli flakes, mostly on the egg but also on the ramen itself. As you can see i used the "baby corn flowers" to dress up my meat. Dressing your ramen is very important! and its very fun! Thanks for reading and if you have any questions or comments, please leave them i dont bite! If you make this, show me yours!! The only bad thing about this instructable,is that you can't taste it while reading it.. Excellent instructions. I make ramen pretty often, but I was wanting to add a bit more flavor to the broth. I usually just combine a bit of miso with beef broth, but I've been adding more spice. The baby corn and ginger are a nice touch. the stock was very tasty, thanks for the recipy i enjoyed it a lot!!! I actually bring some soy sauce, rice wine vinegar, mirin, sake, and brown sugar to a gentle boil quickly. Shut off the heat and stir until the sugar is dissolved. I then cool this mixture and put my really, really soft boiled eggs in it overnight (a minimum of an hour would work too). You get that wonderful flavor on the outside of the egg. The longer you marinade it the more it soaks up. I also like to put raw egg yolk in it too. The solution firms up the outside while making a beautiful glossy fatty element inside. If you put your egg in cold water with the hole poked in it and THEN being it to a boil you won't lose as much egg, if any at all. I find this makes an incredibly complex flavored broth. The reconstituted mushrooms is a nice trick, though I usually use fresh ones. Shiitake are definitely the way to go. I may start stocking and give that a try next time though. I prefer to boil the egg with my soup poached egg style-I find this makes for a more streamlined process. Very nice and detailed Instructible, and looks delicious! Despite my being a complete cooking dummy, I did give this a try. Unfortunately mine didn't come out very well. I'm trying to convince a friend who is more able in the kitchen to try this, we'll see how that comes out. Where can I get Dashi powder? I've been wanting to make okonomiyaki and i can't find dash powder at the local supermarket. Hi, yes you cant get it from the supermarkets here. There are some health food shops that will sell it, at a higher price. I found it was actually cheaper to just go to the global Rakuten site and order it from japan, it ended up cheaper, more bang for your buck! 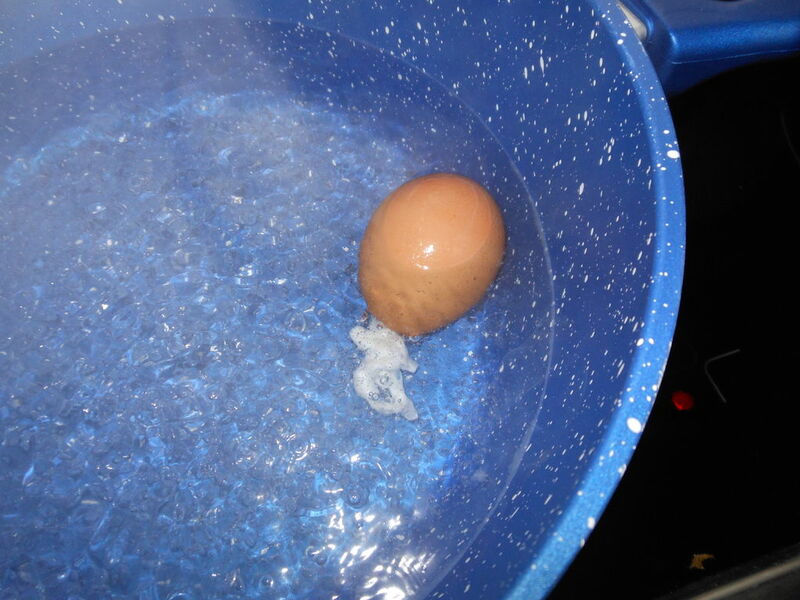 From The Modernist Cuisine At Home cookbook I learned a very clever way to peel a boiled egg. Scorch the shell with a torch, I use a creme brulee torch, but I'm willing to bet that a butane lighter will work as well. Having done this, the shell will pull away quite easily. ewok85 .... Love this recipe. my grandson and I are venturing into the world of Japanese cooking and love trying out various methods and recipes. Just like there are 50,000 ways to make a chocolate cake, we have found there are hundreds of ways to make various Japanese dishes. Wolfinlied, I would love to see more from you. Thank you so much, you made me smile :) I had taken photos for another kind of ramen last night, but never wrote it up because i was feeling a bit bummed out. Im trying to use ingredients that are easily available instead of ones you need to order from other countries or hunt in specialty stores and pay a lot of money. Thank you for your comment, comments like this give me drive!